There is considerable talk nowadays about “replicating” Gujarat’s rural model. And for this, a senior Government of India official even gave the example of a “dream village”, Pansuri of North Gujarat, claiming he saw Wi-Fi connectivity, AC schools with CCTV cameras, streets which are paved with RCC, people getting mineral water, and children getting excellent midday meal. He seemed to suggest that this is “Gujarat’s rural model”. All this, as a report on the village suggests, has happened because of NRI funds. Obviously, officials have not contributed anything here. But apparently, the official concerned perhaps did not have time to visit other villages. He should do it now, during monsoon, when villages are inundated, there is no drainage facility, and the areas that had natural drainage have been blocked due to unplanned developmental activities taking shape all around. 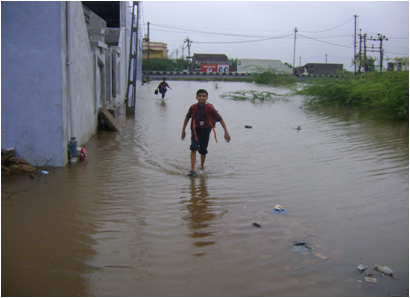 Finding official’s claims odd, a few of the Navsarjan Trust’s volunteers surveyed how things were during monsoon. 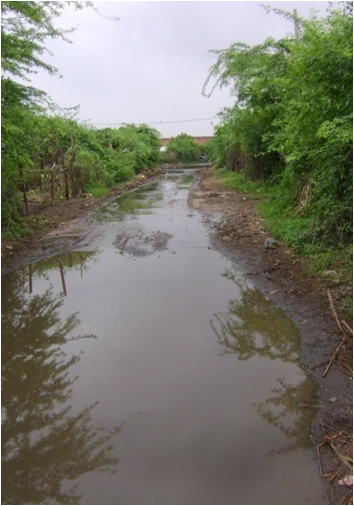 This is what they found during their spot inspection: Inundated villages due to moderate to heavy rainfall, no facility to drain out water even several days after it stopped raining, imminent danger of water borne diseases, and lack of requisite health facilities available in the village. They also found, during their visits, that in one of the villages the school roof was seeping heavily, the support wall had got damaged, and children were offered poor quality midday meal. This, they found, was particularly true in Bhal area’s Dholi village, situated in Surendranagar district, whose main road got blocked due to water logging following rainfall. It became impossible for people to either enter in or move out easily, and vehicles wouldn’t just agree to ply. If one walked in, there was a constant danger of getting mired into knee deep waters, especially at the Ramji temple, situated in the middle of the village. Despite demands from panchayat officials to do something, nothing seemed to move. Things were found not very different in Central Gujarat. 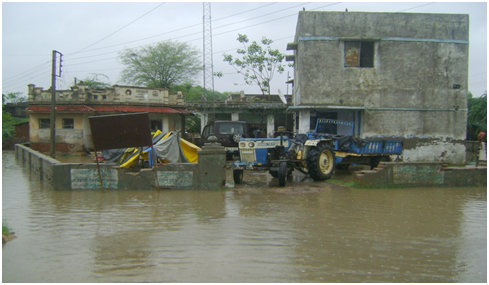 In Saiyat village of Thasra taluka of Kheda district, for instance, Navsarjan volunteer Manubhai J Rohit was forced to write a letter to the district collector, Kheda, pointing out that the Dalit locality situated next to the village panchayat office had been “completely inundated”, and there was no way that the water could be drained out. “Currently”, he wrote, “Even the panchayat office has turned into an island, and it is forced to operate with great difficulty. It is surrounded by water from all four sides.” In fact, there were “knee deep waters stationary for several days at other places, too, but the panchayat officials are helpless.” There was an anganwadi which had “stopped functioning as children cannot be brought in there.” Dirty water had got mixed with rainwater, bringing with it danger of proliferation of different types of diseases. 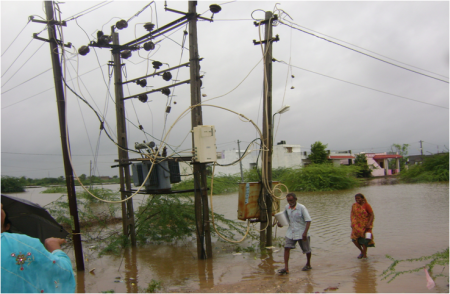 Nearly 300 families had been adversely affected. If rural Gujarat is in dire straits, areas surrounding smaller towns are no different. Natubhai Lakhabhai Parmar noticed this on the highway to Rajkot, on both sides of Ganpati-Fatsar bypass, situated in Vadhvan taluka of Surendranagar district. Here, following the construction of the bypass, the rural and semi-urban localities had been getting inundated for the last two years. Last year, when such a situation took shape, and waters entered each of the 1,500 houses situated on the two sides of the bypass, and people represented to the government officials, but none seemed to listen.